RGMVM NYC Bulldogs 200 Triple Crown Sports Sping Chill Champs! 10U RGMVM NYC BULLDOGS OPEN THE 2005 SEASON WITH A BANG! The 10-year-old RGMVM NYC Sprint sponsored Bulldogs boarded the bus for their initial tournament of the 2005 season. After a long winter, it was time to break off the leash and get into gear. The Bulldogs traveled to Brookhaven Long Island for the Triple Crown Sports  First ever Spring Chill Tournament. On a beautiful Sunday for baseball, the dogs would take to the field for three exciting contests. The Bulldogs would defeat the North Shore Mariners 16-5 in game one. In game two the Dogs defeated the North Shore Royals 11-1. In the game of the day, the Dogs would battle a Tough Staten Island Titans team defeating them 5-4 in a great pitchers dual. The doggie defense would flash some leather in the 5th and 6th to support a gusty mound performance from Big Dog Piteo to seal the victory. John Cadelia (1-Triple) and Bryan Torres (1-Double). Getting the Victories on the mound for the Dogs were Eric Tully (9 Strikeouts) Africa Williams (7 Strikeouts )and Chris Piteo (5 Strikeouts). Congratulations to all the Bulldogs on their tournament Victory. The third Annual Bulldogs Pasta Night Fundraiser will be held on Saturday, April 23 at 7:30PM - St. Margaret's Hall. RGMVM Travel Team Bulldogs Go All Out In 2003 ! - The Team Went 18-0 In The Federation / AABC Regular Season. - The Team Went 2-1 In The playoffs and Beat The Staten Island Reds For The New York State AABC Championship. - The Team Won the PONY Regional New York Championship going 5-1. - The Team Shagged Fly Balls At Keyspan Park For The Top Major League Draft Picks. - The Team Was Honored At Shea Stadium Before The Mets Game and Given The Mets Spirit Award. - ALL The Team Players Were Issued State Proclamations From Senator Maltese. - All The Team Players Were Issued New York City Council Proclamations From Councilman Gallagher. - The Team Appeared On Good Morning New York Channel 5 (Twice) In Conjunction with the Long Ball Club. The Bulldogs Honored At Shea ! The RGMVM 8 Year Old Travel Team was honored on the field at Shea Stadium before the Mets game on September 19, 2003. On the field joining the team and manager Rob Hofmann were Councilman Dennis Gallagher, State Senator Serfin Maltese and the newest Met rookie sensation Danny Garcia. The team was honored for their 2003 New York State AABC / Federation tittle. The Bulldogs Win The East Regional Pony Championship ! The Awesome Picthing Staff of The Bulldogs ! UPDATE: THE RGMVM 8 YEAROLD BULLDOGS ADD ANOTHER CHAMPIONSHIP IN 2003 ! The RGMVM Bulldogs beat the Staten Island Giants to take the New York Eastern Regional PONY Tournament. The game was played in Bergen Beach. The final score was RGMVM Bulldogs - 4 The Staten Island Giants - 2. Congratulations to all the players. There were 8 teams in the round-robin elimination tournament. The teams that competed came from Brooklyn, and Staten Island. out firing on the mound pitching 3 strong innings recording 5 strike outs along the way. and alertly fire home to Catcher Mike Guglielmi who would apply the tag. The Bulldogs would hand the ball to young pitcher Ryan Schulz, young Schulze would battle through the tough Bonnie lineup giving up one run. Bonnies would load the bases, the next batter would slam a long drive in center field that Rick Fleri would track down to retire the side. In the Sixth inning Ryan would slam the door with 2 strikeouts for the save. Getting it done with the bats were. dogs traveled to Bergen Beach for some Pony Tournament action. The Bulldogs handed the ball to crafty pitcher Matt Fox and he would get the dog pound off on the right foot pitching 2 innings and striking out 5 batters along the way for the win. The Dog Pound offense was foaming at the mouth to get things started and they did it in a powerful way. Flexing muscle for the dog pound were. Yes, there was another Moose Sighting. The Mighty Moose took to second base and scored 2 runs on the day. Closing it out on the mound for the Bulldogs were John Kid Codelia who pitched a solid 3rd inning striking out the side and Nick Lante who would use a great fastball to overpower the oppositions hitters in the 4th. On a great night for baseball the Bulldogs talk a walk on the belt parkway and headed to Bergen Beach for a matchup with the Padres. In the first inning the dogs broke out in dramatic fashion batting around and scoring 7 runs, using a great mix of walks and timely hits. strikout 5 padres along the way. Ryan Schulz would slam the door in the sixth inning with 2 strikeouts of his own to close the game. Getting it done with the bats for the Bulldogs offense were. the RGMVM Bulldogs and as it was all season. This game was going to come right down to wire, and it was going to be a great ending stay tuned. bases loaded to plate 2 runs and open the score to 5 - 0. The Dogs would then hand the ball over to their ace pitcher Chris Piteo. The Big Dog would blaze through the 4th and 5th striking out 3 Bonnie batters to hold the lead and set the stage for the dramatic ending. In the sixth, the dog would have to get through the middle of the Bonnie lineup. The Bonnies would draw a couple of walks and eventually load the bases with two outs. deep breathe and grasp back for one more fastball. Cruz would drill a long drive into the left center field gap, center fielder Rick Fleri took off at full speed and dives.He knocks the ball down, Shortstop Matt Fox gets the relay in the middle on no mans land and fires a tremendous throw towards home plate as 3 Bonnie runners come around to score. Mike Guglielmi grabs the perfect throw from Fox and slaps the tag on the runner to end yet another dramatic game. The RGMVM Bulldogs once again were on the road and heading to Bergen Beach for the championship game of the Pony Regional championship game. The Bulldogs would face the Staten Island Giants who they had lost a hard fought game too earlier in the tournament. The Bulldogs handed the ball over to crafty starter Matt Fox, after a couple of strikeouts and walks the bulldog defense would make a costly mistake on a tapper in front of the mound that would allow two runs to score on the play. The Bulldog offense would load the bases in the second inning but were unable to get the big hit. Jonathon Murphy would slam a double in the third inning, however once again the bulldog offense was unable to break through against the good Giants pitching. Ryan Schulz was once again on the hill for the Bulldogs throwing smoke and using his infield. Ryan would pitch 2 innings striking out 5 Giants along the way and giving the offense a chance to get back in the game. to the mound. The Big Dog, would fire his fastball and get a couple of defensive plays from the R-Train to keep the opposition at bay. In the bottom of the frame, the Doggie offense would break out against the Giants ace pitcher Spitzburger. Matt Fox would smack a single and after walks to Fleri and Acosta, up would step Ryan Schulz. This would be the Snapple turning point of the game, on an 0-2 count young Schulz would smash a long drive into the left center field gap. The drive would bring all three runners home and give the bulldogs a lead that they were not ready to relinquish. In the fifth the bulldogs would get on the board again, after a single by Big Dog Piteo and some nifty base running stretching a single into a double catcher Mike Guglielmi would drive him in with a fielders choice. The Big Dog, would cruise through the last and the celebration was on. In a tournament that carried over the month of august, with a short roster of sometimes only 9 players the young bulldogs showed heart and character and a will to win. The team went 5-1 in pool play competition. They beat the Brooklyn Bonnies twice, the Joe Torre Little League once, the Staten Island Padres once and the Staten Island Giants once. The combined scores for the team was 47-10 with a team era of 1.6. The team will now enter the fall ball season. The Bulldogs Win The NY State Federation Tittle! The Lethal Offensive Attack Of The Bulldogs On Display ! The 8 Year Old Bulldog RGMVM Travel Team Wins The New York State 8 Year Old AABC (American Amateur Baseball Congress (AABC) / Federation Roberto Clemente Division Championship by Beating The Staten Island Reds! The RGMVM Bulldogs laced up their cleats and took their show on the road to Gil Hodges field in Brooklyn to take on the Staten Island Reds in AABC Federation playoff action for the New York State Championship. The Bulldogs would hand the pitching duty over to their young flame-thrower Chris "big dog" Piteo. The big dog would fire away over the first three innings striking out eight reds along the way. The Reds pitcher would match Chris over the first three striking out eight batters as well. The game would be knotted at a 1-1 tie after three. The Bulldogs would finally breakout in the fifth inning, Robbie Hofmann and Matt Fox would get on and once again it was Chris Piteo driving them home to jump out to a 3-1 lead. In the bottom of the fifth young set-up man Johnny "Kid" Codelia would run into a jam after a couple of defensive gems by Robbie Hofmann and Bryan Torres. Johnny would battle a tight strike zone and eventually give up a hard hit double down the first baseline that would give the Reds a 5-3 lead going to the last. In the last the Bulldogs would get the tying runs on base with two out with hard hitting Brett Buser at the plate, Brett would be called out on a controversial third strike to end the game. This put the Bulldogs down a game with their backs to the wall for the second game of the double header. In game two of the double header, the sun was scorching and so were the Bulldogs bats that now were barking and making plenty of noise to support their pitchers. The Bulldogs would breakout early in the first with Chris Piteo knocking a double to center to drive in Fox and Hofmann. Johnny "Kid" Codelia would drive in two more with a hard hit single to right, giving the doggies quick 4-0 lead. The Bulldogs would hand the ball to young right-hander Matt Fox, the Fox would use his sinker and the defense would gobble up the grounders. The Bulldogs would chew out a couple of runs in the second behind the hard hitting of Kid Codelia, Brett Buser and Brandon "Boo" Acosta. The dog pound would keep the frenzy going in the third behind the bats of Matt Fox and Bryan Torres jumping out to a 9-0 lead. three force plays from Chris Piteo at Short to Matt Fox at second making look so easy. In the fifth the dog pound would get jump started with a lead-off triple from Nick Lante, he would be driven in by Ricky Fleri. After a couple of walks Chris Flaim would lace a hard single to left to drive in Fleri and Acosta and give the Bulldogs a conformable 12-3 lead going into the bottom of the fifth. Mike Guglielmi who caught both ends of the double header would gun down a runner stealing to start the innings, the R-Train would cruise into the last stop striking out the last two batters going into the last inning. The Dogs would go peacefully in the 6th, and hand over to Young Closer Brandon Acosta who would slam the door in the sixth inning by striking out the side. With the bounce back victory in the heat, the bulldogs will return to Gil Hodges Sunday for the Championship game. On a day that was made for baseball the young Bulldogs loaded the bus and heading to Brooklyn on the belt walkway to play the deciding game of the AABC playoffs to represent New York State in the Eastern Regional. In the top of the first leadoff man R-Train Hofmann would walk and proceed to steal second and third, Matt Fox would follow with a walk and steal second as well. Clutch Hitting Johnny "Kid" Codelia would drive Hofmann in with a hard ground out to short, the dogs would however leave fox stranded at third. Once again the Bulldogs would hand over the pitching duty to crafty right-hander Matt Fox, and once again he was right on target. Fox would use his good sinker to keep the Reds offense totally off balance and strike out eight batters along the way without giving up a hit. In the top of third the doggie offense would manufacture a run, Chris Flaim would walk and advance on a bunt single by Hofmann. Matt Fox would smack a hard shot to short and Flaim would be forced out at third. After a walk to Big Dog Piteo the bases were loaded for Kid Codelia who would smack a hard shot back to the pitcher who would gun down Hofmann at the plate. With two out and things looking bleak, Bryan Torres once again stepped up and laced a single to plate Matt Fox and give the dogs a 2-0 lead. In the fourth inning with the crowd fully behind the bulldogs the leash would break and the dogs were on the loose. The Reds pitcher was wild walking the first 4 batters, Big Dog Piteo would lash a hard triple to right center to drive in Buser, Fleri and Hofmann. Bryan Torres would slam a hard single up the middle to drive in Fox and Piteo. The crowd was now in a frenzy with the sound of let's go Bulldogs, woof, woof, woof echoed throughout Gil Hodges Stadium.. The dogs kept pounding away with hits from Brandon Acosta and another bases clearing double this time from Ricky Fleri to drive in Acosta, Buser and Guglielmi. When the inning was over the Dogs had jumped out to a 11-0 lead, and the chants where going to the ship and where going to New Jersey rang out from the crowd. In the fourth the dogs would hand over the pitching duty to there young flame-thrower Chris Piteo. Young Piteo would cruise through striking out the side. In the fifth the dogs would put the game away, the dogs would once again load the bases behind singles from Fox a walk to Piteo and a single from Torres. This would set the table for Brandon Acosta, Boo would hammer a shot to center field that would clear the bases and increase the lead to 15-0. With the impressive victory the RGMVM Bulldogs win the 8 Year Old New York State Federation / AABC Championship! They now advance to the AABC / Federation Eastern Regional Tournament Representing New York State. Congratulations to all the Bulldogs. The Bulldogs Capture The Brooklyn Federation Tittle ! The sun was scorching on a sunny evening at Bergen beach. The Bulldogs of RGMVM took to the field to face the Cougars in Federation league action. They dogs would get off to a rocky start behind starter Robbie Hofmann, but relief pitcher Chris "Big Dog" Piteo would right the ship and strike out the side. The dogs would then break out the lumber and get the offense going scoring early and often. Getting it done for the Dog Pound offense were. Yes, there was a Moose sighting. The Moose Matt Hofmann, would jump from the bench to steal a couple of bases during the game. Chris Flaim, would steal 4 more bases on the day as he continues to be a terror on the base paths. Not to be lost in the game was the fine pitching performance by right hander Bryan Torres. Bryan would pitch 2 solid innings striking out six batters along the way to the victory great job. The Bulldogs Clinch The Federation Tittle! The Sun was shinning over Brooklyn's beautiful Marine Park, as the Bulldogs took to the field to face off against the Good Sheppards. The Bulldogs sent young righthanded pitcher Bryan Torres to the mound for the start, he would run into some rocky road and would be relieved by Matt Fox who would limit the oppositions rally with a sharp fastball. Matt would hold the oppositions offense at bay in both the second and third innings giving the Bulldog offense a chance to wake up from their slumber and get going with the lumber. The lumber company would finally get going scoring 19 runs over the next 4 innings to jump out in front, getting it done for the Bulldog offense were. The Bulldogs would then turn the lead over to their young closer, "Cardiac Kid" Robbie Hofmann. Young Hofmann would battle a tight strike zone and wiggle out of a couple of tight jams to slam the door another Bulldog victory. 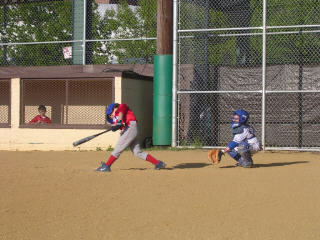 With the Victory the Bulldogs improved to 16-0 and clinched first place in the Brooklyn Marine Park Federation League. Congratulations to all the Players and Coaches, and dedicated parents for all their support. The Bulldogs Beat The Brooklyn Bonnies Again To Go 18-0! Once again the Bulldogs were heading to Gil Hodges field in Brooklyn for a matchup with the Brooklyn Bonnies. The Bulldogs were heading in via train, planes and automobiles. The dogs would jump out early in the first behind clutch hitting from Brett Buser, Nick Lante, and Jonathon Murphy. The pitching duty would go to crafty right hander Matt Fox, young fox would keep the opposing hitters off balance with his arsenal of slippery pitches. Matt would fire three excellent innings, leaving with a 6 to 3 lead and would get the victory. break the game open, doing the hard hitting for the bulldogs were. The Dogs would hand the ball over to Chris Piteo in the last three innings and he would throw a barrage of fastballs to close out the game striking out 7 batters along the way. With the Victory the Bulldogs have improved to an impressive 18 - 0 on the season. The Bulldogs Rally To Beat The Grace All-Stars To Go 14-0 ! On a gloomy overcast Friday night the RGMVM Bulldogs were once again heading to Brooklyn ahead of the raindrops to take on the Grace All-Stars. The Bulldogs would put the ball in the hands of young flamethrower Chris "Big Dog" Piteo, the big dog would be on target keeping the grace bats silent in the first two innings. The Bulldogs would get the offense going early in the first behind hits from Robbie Hofmann, Matt Fox and Brian Torres in taking a 3-0 lead. After some controversy, Matt Fox would come on to pitch the next three innings, the bulldog defense that has been reliable all season would have a few breakdowns that would help the grace all-stars take the lead. In the fifth the Bulldog offense would battle back and tie the game behind the hard hitting of catcher Mike Guglielmi, Nicky Lante and power hitting Jonathan Murphy who would both come through in the clutch to tie the game. In the sixth, the Bulldogs would hand it over to the Closer, Robbie Hofmann. defense would make a few great plays to keep it a one run game. With one out and the bases loaded Johnny Murphy would make a great grab in shallow left field, and Matt Fox would gun a runner down at home to kill the rally. In the bottom of the sixth, the Bulldog offense would dig deep for one more rally. With one out Matt Fox (3-3) would smack a single and steal second to move himself into scoring position. That would bring up the big dog Piteo, who would launch a long drive into the right center field gap that went all the way to the wall for a triple to tie the game. The Bulldogs Beat The Brooklyn Bonnies To Go 13-0 ! On a night that was tailor made for baseball the RGMVM 8 Year Old Travel Team Bulldogs took to the RGMVM bus and headed to beautiful Marine Park for another match up against the Brooklyn Bonnies. This game would be a joy to watch as the game would go right down to the last pitch. The Bulldogs would once again hand the ball to their starter Chris "Big Dog" Piteo, the doggie would fire strikes and keep the Bonnie offense off balance striking out 7 along the way. The Dogs would break out early in the first with 3 runs, on timely base hits by Matt Fox and Brett Buser. The game would stay tight with plenty of leather being flashed on both sides. The Bulldogs would call on right hander Matt Fox, who would provide a gutty performance on the mound in the 4th backed up by his infield defense. The infield would make a few stellar plays to quite a Bonnie rally, but the best was yet to come. In the fourth the dogs would get back on the board again behind the bats of Bryan Torres and John Codelia to stretch the lead to 7 - 2. With a tired Matt Fox on the mound in the fifth, the Bonnies were once again chipping away at the lead. The doggie defense was still fetching grounders and making the plays, the Bulldogs called on young righthander Robbie Hofmann to wiggle out of the jam. Matt fox would make a slick backhanded play up the middle to grab a force at second to kill the rally. The game would move on to the sixth, and fasten your seatbelts because there are nine miles of bad road ahead. The young closer Hofmann would face the heart of the Bonnies order, the Bonnies would get the first two batters on base. On a full count the next hitter lashed a long drive to rightfield that John Codelia would make a tremendous catch and almost double of a runner advancing. The Bonnies would load the bases and this would set the stage for the Snapple turning point of the game. On a full count and everyone in attendance holding there breathe, in John Franco fashion young Hofmann released his pitch. The Bonnie hitter lashed a hard shot up the middle, Chris The Big Doggie Piteo comes from nowhere to lunge out and stab it flipping to Matt Fox for a force at second. Fox is knocked down by the opposing runner, as the bonnie coach waves his runner furiously around third base with the tying run approaching the plate. Young Fox would spring to his feet and fire a seed to the plate were catcher Mike Guglielmi was waiting to apply the tag, in a cloud of dust the echo of "YER OUT" rang out across the field and a jubilant Bulldog team celebrated the victory. A double play to end the game, just your routine average double play. A true team effort, where everyone contributed and left it all on the field. This is what this team is all about..
Woof..Woof And Another Woof Go Bulldogs!!! Woof..Woof. The Dog Pound Rolls On ! The Sun arrived and so did the Bulldogs. The RGMVM Bulldogs took to the field at Sunny Gill Hodges Stadium in Brooklyn for another matchup with the Grace All-Stars. The dogs would break out early in the first behind some hard hitting from Matt Fox, Chris Piteo, and Bryan Torres driving in 4 runs in the first. They would hand the pitching duties over to young flame-thrower Chris "Big Dog" Piteo, he battle throw a tough first inning and then got in gear and used a sharp fastball to keep the doggies in front. The Bulldogs would chip away scoring single runs over the next 5 innings with everyone contributing stealing bases and moving runners with timely hits. Getting the big hit for the Bulldogs was once again Johnny Murphy crushing a drive in the right center field gap for a double, driving in run. The Dogs would hand the ball over to crafty right hander Matt Fox, young Fox would battle through a tough jam in the 4th making a nice play on a come backer getting a force at the plate to kill a rally. The doggie defense came to play, with Chris Piteo killing an opposing rally grabbing a hard line drive from the air in turning a double play. Brandon "the Vacuum" Acosta made a tremendous diving play in the hole to steal a hit away from the opposition, and Bryan Torres made a great grab of a sinking liner in the 6th inning to help close the game. With a solid mix of Pitching, defense and timely hitting the dogs continue to roll. The win keeps the doggies unbeaten at 9-0. The Bulldogs On TV As They Invade Keyspan Park ! that idea, saying " The Moose Is Just Too Valuable To Lend Out With The Team Approaching The Playoffs". Keep Them Doggies Rollin.. Rawhide ! The RGMVM Bulldogs took to the Parkway for an early Father's day morning contest with the Shepherd Boys at Bergen Beach in Brooklyn. The Sun was shinning and the weather was hot, but not as hot as the Bulldogs offense. The Dogs would get plenty high-powered offense in this one, getting it done for the Dog Pound were heavy hitters. The dogs would launch 2 Home Runs on the day, the first a bomb to dead center field by Chris "Big Dog" Piteo, the second would be a laser beam shot way down the left field line to clear the bases for a grand slam by third baseman Brandon Acosta. The Doggies would use four different doggie hurlers to chalk up the zero's to combine on a no-hitter. Getting it done behind the plate, calling a great game and gunning down opposing runners was young catcher Mike "wheels" Guglielmi. Woof.. Woof... Go Bulldogs. The win puts the doggies at 12-0 on the season. The Bulldogs Open Up The Season ! The 8 Year Old Travel Team Bulldogs Go 2-0 To Start The Season In The PONY League. Read The Following Games Write-Ups For All The Details !! The Doggies would get solid pitching the rest of the way from the "R-Train" Robbie Hofmann and Matt Fox pitching the last 3 innings striking out 8 and not allowing a base runner. With the 21 - 0 win, the Bulldogs improved to 2-0 on the young season. The Bulldogs Continue To Roll ! On a dreary night the travel dogs from RGMVM hitched a ride (more like a crawl) on the belt walkway to Brooklyn just in time to play the Grace All-Stars. The Bulldogs would jump out to an early 1-0 lead behind a hard single from Chris Piteo in the first to plate Rick Fleri with the first run of the game. The Bulldogs handed the ball over to young fireballer Chris "Big Dog" Piteo, who would pitch a solid three innings striking out 8 while allowing one hit along the way. The game would be played tight over the first 5 innings, (with the score 1-0 RGMVM) behind solid pitching and great defense on both sides. Making several fine defensive plays was young third basemen Brandon Acosta. In the top of the sixth with 2 out, the "R-Train" Robbie Hofmann would smack a single into left field to drive in 3 runs to give the Dogs a 4-0 cushion. In the bottom of the sixth a tired Matt Fox took to the mound having pitched an overpowering fourth and fifth striking out 6. The Bulldogs defense would not be sharp and the Grace All-Stars would tie the game and force extra innings. The the extra frame, Brandon Acosta would spark a two out rally by beating out an infield single and then stealing both second and third with a great slide. That would bring up "the Bomber" Jonathon Murphy, who would smack a single into shallow right field for a single and drive in the go ahead run for the Dog pound. In the bottom of the inning, the dogs would hand it over to the "R-Train" Hofmann who would surrender a leadoff single and then go express in striking out the side. This was a real gutsy team effort by the young RGMVM Bulldogs. The win would put the team at 4-0 early in the season. On a dreary Mothers Day morning, the young Bulldogs were unleashed to take on the Bergen Beach boys in Brooklyn Pony action. The Bulldogs took to the field and handed the ball to young flame-thrower Chris "Big Dog" Piteo, the Doggie would be right on target striking out 7 along the way and not giving up a hit. The Bulldogs, would get an early offensive boost in the first inning from leadoff man Matt "Moose" Hofmann who banged out two singles in the inning. Getting it done on the offensive end for the Dog Pound were. Chris "Big Dog" Piteo (2-3), Mike "Wheels" Guglielmi (1 - 1), Robbie "R-Train" Hofmann (1-1), Brett "Speedy" Buser (1-2), Ricky Fleri, (1-2), Brandon Acosta (1-1), Chris Flaim (1-2). The Bulldogs would hand over the ball to Rocket Arm Nick Lante in the 4th and 5th innings he would finish up the game in impressive fashion striking out 6 batters along the way to the Bulldogs victory. The RGMVM Bulldogs Chew Out Another Victory ! On a great night for baseball the young travel dogs of RGMVM took to the field at Marine Park in Brooklyn to face the Bonnies. The Bulldogs would hand the ball over to young flamethrower Chris "Big Dog" Piteo and he would throw three solid innings to keep the hard-hitting Bonnie offense at bay. The Dog pound offense would break out in the first behind their patient hitting and great base running. Doing the damage for the Doggie offense was. - Chris Piteo (2-3), John Codelia (2-3), Brett Buser (2-3). The Dog's would keep chewing out hits and walks to stretch their lead, and then hand over the pitching duty to young hurler Matt Fox. Matt would pitch the fourth inning and battle through a tough jam to secure the win. Not to be lost in the game was the emergence of the Bulldog defense, playing solid up the middle were Matt Fox at Shortstop and Robbie Hofmann at second making plays when needed. Chris Piteo made a couple of diving plays off the mound to kill the opposing rallies. Brian Torres was solid in Right Field making a couple of strong relay throws to keep runners at bay. This was a real solid team effort by the Bulldogs putting all aspects of the game together. With Their win the Bulldogs go to 8-0. Great Job..